For many Italians eating a lavish portion of spaghetti al pomodoro, with tomato sauce, is almost like coming back home after a long trip. It might be the way we twirl the spaghetti with a fork, a gesture which is written in our DNA. And if you ask, no, we do not use a spoon now, even though my grandfather, which was from the South of Italy, used to to do that. Now this would look and sound old fashioned. It might be the tomato sauce, which every time carries out an attack to your perfectly white shirt, or the overwhelming basil aroma. It might be for the colours, so typically Italian, a stereotype that we embrace intentionally, and with satisfaction. Everyone has his favourite tomato sauce: garlic or onion, basil or parsley, olive oil or butter. Oh, the stories that are concealed in a saucepan of tomato sauce! Generations of testing, addition and subtraction, traditions that gain strength or crash on the use of a clove of garlic. Not to mention the olive oil, the most representative ingredient of our country, the bass player of the tomato sauce, the backbone of a melody played by tomatoes. Next to spaghetti al pomodoro, you will always find a mention to spaghetti aglio, olio e peperoncino, an elementary dish of spaghetti tossed with garlic, extra virgin olive oil and chilli pepper, a recipe you are supposed to master even if your knowledge of the Italian cuisine goes barely beyond the basics. 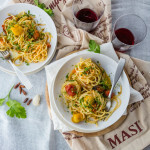 It is a simple dish which can be cooked at any time with what you have in the pantry, something to prepare late at night when friends show up unexpected at home, a bowl of pasta for small hours and large portions. The smell of garlic gently frying in the olive oil is like a spell, it takes you home wherever you are in the world. It is the poorest dish you can imagine: just extra virgin olive oil, garlic, chilli pepper and a package of dried spaghetti, something which every Italian is supposed to store in his pantry. 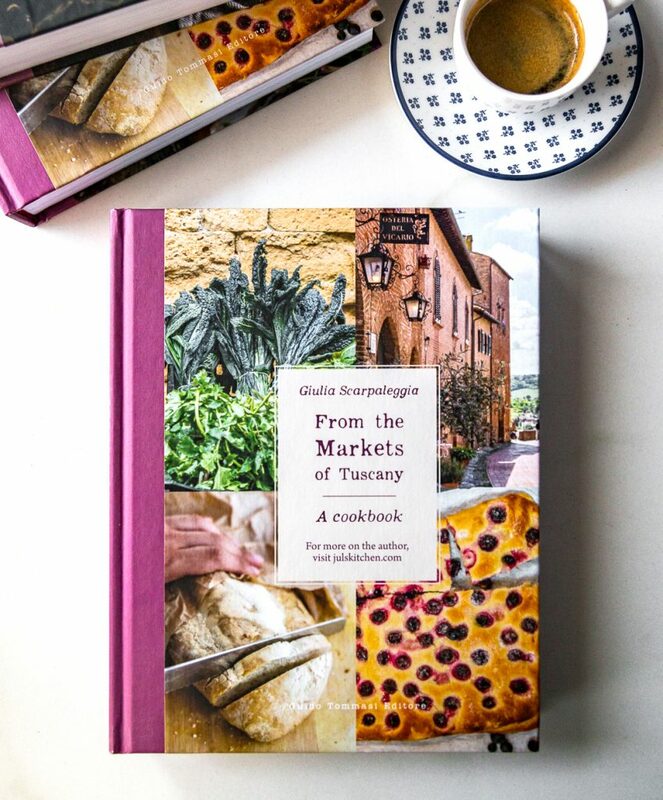 If it is done by the book, though, it reaches levels of absolute perfection: the pasta is soaked by the taste of garlic infused olive oil and the chilli pepper tickles your taste buds without covering the other flavours. Then comes the parsley, fresh, finely sliced, the green touch that the pasta was missing. The spaghetti with garlic, olive oil and chilli peppers are suitable as a base to add other ingredients at the very last minute: cherry tomatoes, mussels or clams, never cheese, though. Now imagine what would happen if a dish of spaghetti with garlic, olive oil and chilli pepper meets a bowl of spaghetti with tomato sauce. It can’t be more Italian than this. Preparing this recipe is like concentrating summer in a dish. The slow-roasted tomatoes are cooked slowly in the oven to deepen their sweet flavour. Choose tomatoes of different colours – yellow, red, brown… – so that they will also give an unusual chromatic appeal to your spaghetti. Once the slow-roasted tomatoes are ready, you can store them in the fridge for several days. 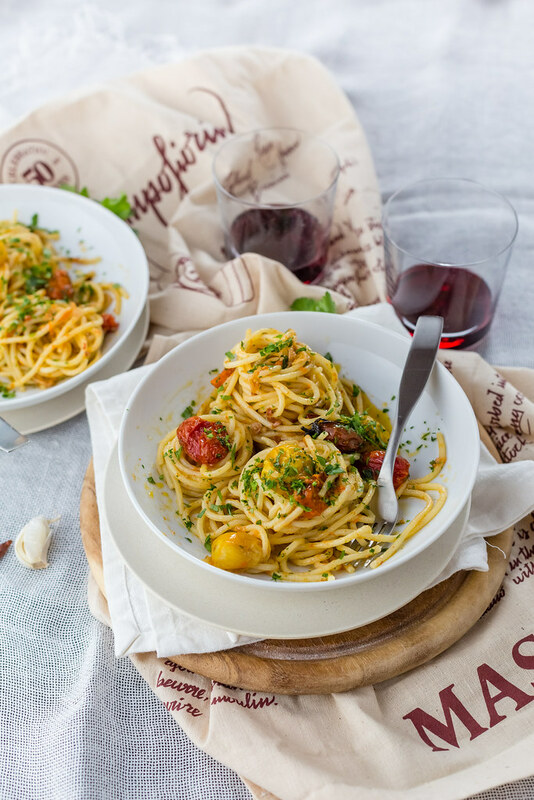 Add them to the most classic of the Italian dishes, spaghetti with garlic, olive oil and chilli pepper, for am easy and flavourful summer dish. 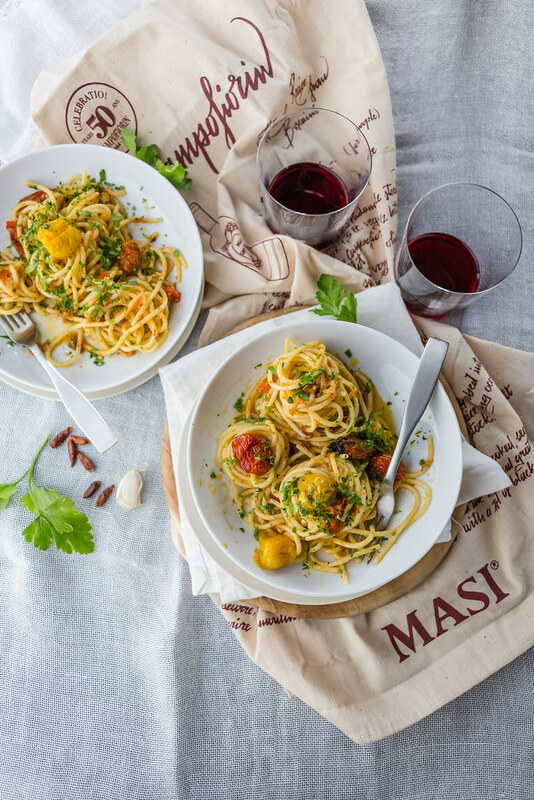 A new recipe for Masi Campofiorin50. Prepare the slow-roasted tomatoes. They can also be made in advance and stored in the fridge for several days, covered in olive oil. Wash the tomatoes, place them on a baking sheet and drizzle generously with extra virgin olive oil. Sprinkle with salt and scatter the thinly sliced garlic over the tomatoes. Roast in the oven at 150°C for an hour, then turn off the oven and let the tomatoes inside until cold. Spoon the tomatoes with their sauce in an airtight container or in a jar and store in fridge until ready to use them. Cook the spaghetti in boiling salted water. Meanwhile, heat the oil in a skillet over low heat with the garlic cut into thin slices and the crumbled chili pepper. When the garlic has softened and almost begins to melt, add the slow roasted tomatoes with some of their sauce. Drain the spaghetti al dente, pour them into the pan, toss to season and serve with chopped parsley. Tomatoes in my family tradition: tomato purée, the preserve and pomarola, our tomato sauce. The spoon question, or how to eat pasta like an expert, an old piece on the New York Times. With America in the throes of what has been called the ”pastarization of the nation,” when enthusiasm for fusilli and fettuccine, ziti and spaghetti is at an all-time high, it may be time to pause to examine what is right and what is wrong with various techniques for cooking and eating pasta. You are probably doing it wrong. 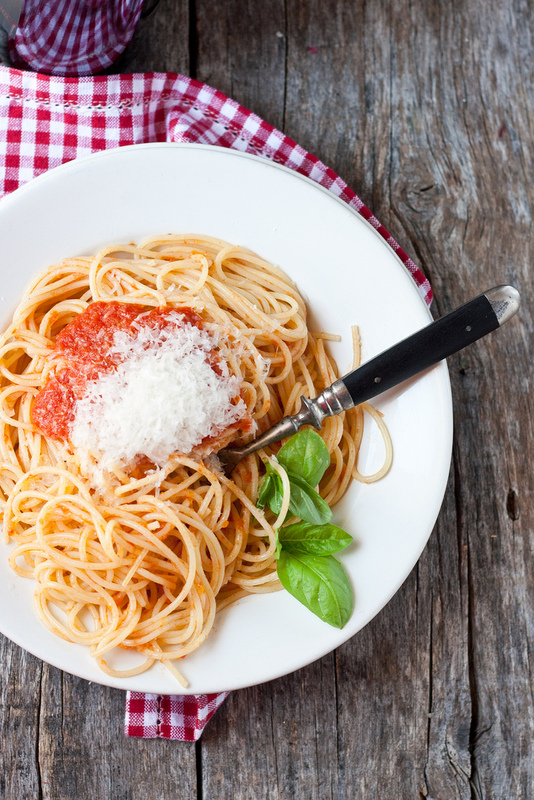 How to eat pasta like an Italian. David Leite and Maureen Fant talking about good habits and adamant rules on eating pasta. Mark Bittman and his pasta aglio, olio e peperoncino for the New York Times. Aglio e Olio: The One Pasta Sauce You Absolutely Must Know. If there were a pasta bible, the first line would read, “In the beginning, God created aglio e olio.” Historically, that line wouldn’t really be accurate, since the evidence doesn’t support the idea that garlic (aglio) and oil (olio) were the original accompaniments to pasta. But structurally—and by that I mean the way most pasta sauces today are cooked—aglio and olio are almost always the first step. Giulia! I love Italian food, and how simple this recipe is, yet so vibrant and full of taste (I can just imagine how good it is from the ingredients.). So glad we met in WWC and even gladder to be on the writing journey together! YUM. this looks delicious! love a good spaghetti dish and this one i definitely will be trying. Thanks for the awesome recipe Giulia!